Mill Reef was born in the United States, but rather than destined for the Kentucky Derby, the stallion was shipped off to the United Kingdom. Trained by Paul Mellon, Mill Reef competed in 14 races and registered a record of 12-2-0. 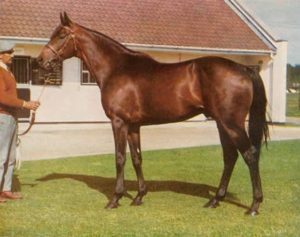 The Stallion only raced from 1970 to 1972, and in that time, he accumulated wins at the King George VI and Queen Elizabeth Stakes, Epsom Derby, Gimcrack Stakes and more. One of the most fascinating aspects of Mill Reef’s wins were the distance in which he finished in front of the competition. At Gimcrack he won by 10 lengths. The King George VI saw him stroll to victory by six lengths; and the Epsom Derby was won by two lengths. In 1972, Mill Reef’s career was cut short due to breaking his foreleg. Although a plate was inserted to fix the fracture, Mill Reef’s racing days were finished and the horse was retired. Over the ensuing years, Mill Reef fathered a number of offspring that went on to successful careers. In 1986, Mill Reef died at age 18. Mill Reef’s legacy lives on in the stakes race named after the famous horse. Founded in 1972, the Group 2 flat race is run at Newbury. During his successful career, Mill Reef was ridden to victory by Geoff Lewis. The extraordinary jockey reached fame and fortune thanks to the horse and in 1999 retired from the sport. Now 82, Lewis won a laundry list of cups and trophies during his illustrious career and a number of those came with Mill Reef.